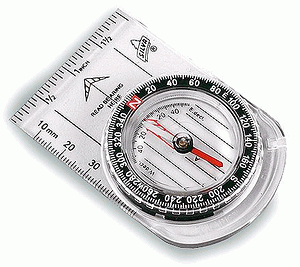 Orientate a map and use a draggable rotating animated compass to read a compass and map route bearings. Note that the compass bearing to find the footpath down from the top of Ben Nevis (the purple circle) is 280�, plus a 4� compensation for grid north and magnetic north variation (see below). The bearing will vary according to the exact location of your compass, either on the map, or if you were on the actual mountain top. The method of using a compass is very simple. 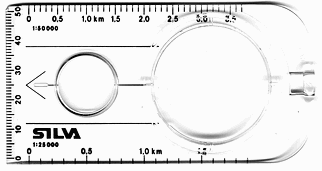 The compass has a central circular dial which rotates on a rectangular compass base. Inside the circular dial is a magnetic needle which swivels independently, always pointing to this planet's magnetic north. There are three items that can be rotated: the central circular dial, the red magnetic needle, and the rectangular compass base. The arrow on this base is then used for reading and following a bearing. The complete compass - a very misleading, but very common picture. The red (magnetic) needle and north on the central circular dial or housing must ALWAYS be kept aligned. While keeping the red (magnetic) needle aligned with north on the central circular dial, the rectangular base must be rotated to read the compass bearing (in degrees) that you need to follow. The rectangular base arrow shows the direction of travel, shown in the Ben Nevis compass animation screenshot below. When using the compass with a map, the compass should be placed on the exact map location you wish to take a bearing from. Align the red (magnetic) needle with both north in the central circular compass dial and with the grid lines running north on the map. While maintaining this alignment, rotate the rectangular compass base until its arrow points in the direction you wish to follow. The bearing (in degrees) should be read from the central circular dial at the point where the rectangular compass base arrow aligns with it. Follow the direction-of-travel arrow on the rectangular compass base. Magnetic north varies slightly both from grid north on the map and true north (the north pole). Your map will tell you how many degrees to add to your bearing. This can vary depending on where you are in the country. An addition to your compass bearing of 4� will compensate for the magnetic variation at Ben Nevis. Note that the direction you walk in is always the arrow on the rectangular compass base. Remember while following a bearing to always keep the red (magnetic) needle and north in the central circular dial aligned. To help you stay on track, take regular bearings during a trip, dividing a journey into short sections and taking new bearings from the landmarks seen on the way. If the clouds descend while you are on the mountain, reading a compass correctly can be a life-saving skill. In poor visibility, it is essential to use a map and compass. Hazards can be avoided by following bearings for distances measured from the map. Calculate the distance while you are walking, by counting the number of paces taken and multiplying by the distance of each pace. Keep the compass away from all metal objects since these can result in false readings by deflecting the magnetic needle. Objects to avoid include wristwatches, keys, tables with metal legs or steel screws, mobile telephones and even heavy framed spectacles.